Cooking everybody's favourite dish became easy with Knorr Complete Recipe Mix Kare-Kare. Now, you don't have to wait for a celebration to happen. Cook anytime of the week. It's delicious! 1 Get a pot and fill it with 6 cups of water. Cook the beef over simmering water until tender. 2 Now, get another pan and make it nice and hot over medium heat. Pour some oil and saute the onions, garlic and tender beef. 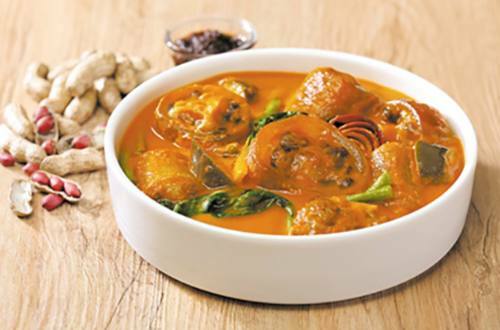 Pour in the Knorr Complete Recipe Mix Kare-Kare dissolved in 2 cups of water. You have the option to add ground peanuts. 3 Add the vegetables and allow to simmer until cooked through. There's always a reason to celebrate especially when the whole family is together. Serve Kare kare, it binds everybody together.